At 12:01 a.m. on August 1, 1981, MTV launched their empire, kicking off their programming with (ironically enough) “Video Killed The Radio Star” by The Buggles. While here at WRSU we don’t particularly subscribe to that narrative, it’s clear that MTV made music videos one of the most important promotional tactics in the industry. Initially music videos were seen as good PR more than anything, but artists quickly saw them as another way to express their creativity. Michael Jackson and John Landis broke all barriers for what could be considered a music video in 1983 with “Thriller”, which cost $800,000 to make. Not stopping there, Michael and his sister Janet made the most expensive music video of all time ($7 million) with 1995’s “Scream”. Since then, artists have been finding imaginative ways to visually represent their songs. In this day and age, music videos can still be incredibly powerful displays of culture, high art and an artist’s message. Three fairly recent music videos have demonstrated the power of using film to elevate a song, in three very distinct ways. Although “Humble” garnered all the Grammy nominations, Kendrick Lamar’s music video for “Element” is a bold piece. 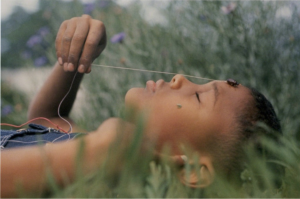 Directed by Jonas Lindstroem and The Little Homies (the production duo of Dave Free and Lamar), the video brought the work of famed photographer and director Gordon Parks to life. Gordon Parks was an African American photojournalist who shot poor citizens for the Farm Security Administration, capturing stark representations of American life. He moved on to shooting covers and photographic essays for Life Magazine, bringing his work to a worldwide audience. In a career that spanned many decades, Parks also became the first black man to release a major Hollywood film and created one of the enduring films of the blaxploitation era, Shaft. The braggadocious, aggressive flow of Lamar is juxtaposed with many of Parks’ storied photographs, but his creative team make adjustments to the photos to fit the video. For instance, a scene in the video is based on the 1963 photo Boy With June Bug. The original portrait is a boy lying in the grass with a june bug on his forehead, attached to a string. Lamar’s camp reinterpreted the image, slightly changing the angles and the color, as well as having the bug move around. Subtle reimaginings of Parks’ work emerge throughout the video, and speak to Lamar’s pro-black message. Of course, there’s still original scenes throughout the film and the themes of black life that pervades Lamar’s art that shine through. Paying homage to a boundary breaker before his time and utilizing past work to emphasize his message is a powerful method for a music video. While Lamar’s videos often veer into the surreal, many of his contemporaries stay grounded in reality. As referenced earlier, music videos tend to be costly endeavors, with labels giving artists large budgets to make the short films. Recently, those budgets have started to be used in increasingly unique ways. Two instances that deviate from music video norms come from Drake and Young Thug. Drake’s new video for God’s Plan had a very simple concept. To start the video, he stated the budget he received from the label was $996,631.90. Then throughout the video he gave it all away, to regular people, and documented it. He gave away scholarships, cars, charity donations and shopping sprees. It’s a positive, heartwarming video to match a song with a generally positive message. Of course some have questioned his intent and argued that it may be in poor taste, like Hot 97’s Peter Rosenberg. For those arguing that radio is irrelevant, let it be noted that Rosenberg’s questioning of Drake’s authenticity garnered a response from the reclusive rapper himself. However, by and large the reaction to the video has been overwhelmingly supportive. It’s an example of a celebrity using his affluence to help others, and regardless of whatever PR was involved, it’s a good look for Drake. Something that isn’t good for perception is flaking on an obligation, but that’s exactly the theme of the video for the song “Wyclef Jean” by Young Thug. The video revolves around the attempted video shoot, and how Thug never actually showed up to set. The director, Ryan Staake walks through the day they were supposed to produce the video and everything set up in pre-production. Strippers, toy cars, and a rented mansion were all involved, and were waiting for the star of the show, Young Thug, to arrive. Through various circumstances he never did, so the day devolved into everyone on set making the most of the botched shoot. The video was a full “Inception” move, with Staake constructing a video inside the remains of a prior video. The strippers and extras had mini drag races, destroyed cars, and decided to have fun with what was available regardless of whether or not the artist was there. They still used the whole budget, but in a completely different way than planned. It’s truly one of a kind, and even if you don’t like Young Thug’s music, a music video that’s actually about the process of music videos is rare and engaging throughout. There are more types of music videos now than ever before. Videos can be good marketing, or part of the artistic vision for a project, or both. The subtle connecting themes of music videos can make a world of difference, and it’s clear why the medium has gone from basic promo to artistic endeavors. You can find all types of connections to the music, so next time you watch a music video, try and see the intent behind the finished product.